If you’re like me then you love keyboard shortcuts. If you’ve come to OS X from a Windows background then most of the shortcuts are very similar in function. In a PC world when you use the familiar Alt-Tab keystroke it cycles through all open windows. 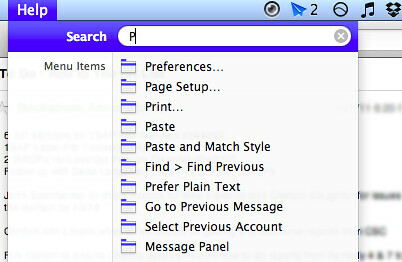 The OS X equivalent, Command-Tab, switches from one app to another, however—not all windows in all apps. 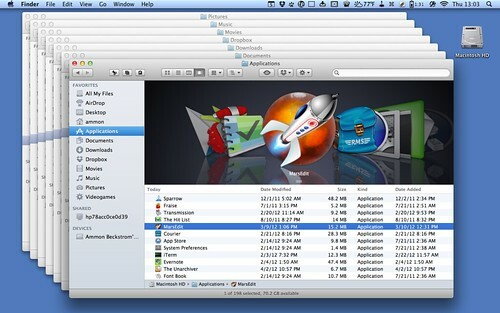 … or if you’re using an app with a multi-window user interface like MarsEdit. To quickly switch from one window to another in the same application use the keyboard combo Command and ` (the key just above Tab on the left side of your Mac’s keyboard). This little shortcut should save you some frustration. I wish I’d known about it much earlier. What are your favorite OS X shortcuts? Sound off in the comments below. 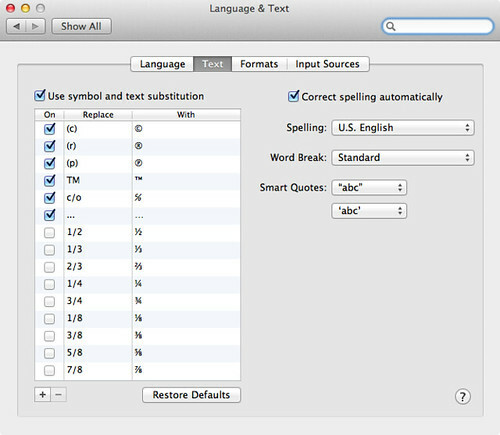 This entry was posted in Mac Tips, MacTacular, Productivity and tagged Finder, how to, howto, Keyboard shortcut, mac, Mac OS X, osx, postaweek2012, shortcuts, tips on April 5, 2012 by Ammon. Warning, this post contains immature language. Don’t let April Fools Day catch you off guard this year—be prepared! I’ve got the perfect prank for you to play on your family, friends, and co-workers. Chances are really good that everyone you know has at least one of the following: an iPhone, iPad, Mac, or PC. I’ve got a prank for you that you can use on all of those devices. 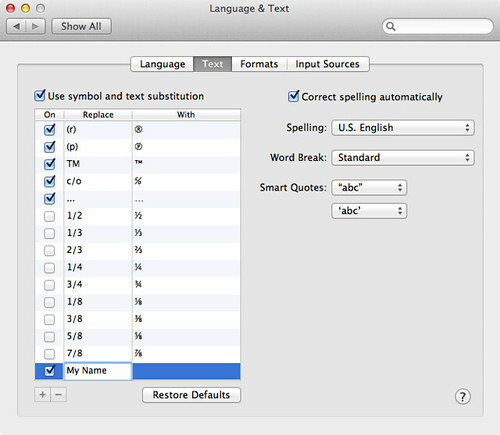 The AutoCorrect or text substitution feature built into OS X, iOS, and Microsoft Office can be an amazing productivity boost. 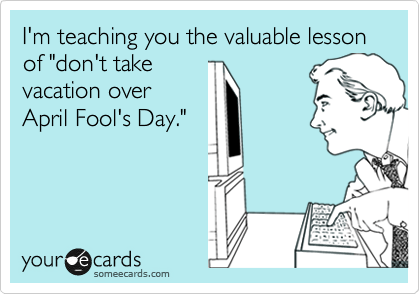 But, it can also be used to freak out your unsuspecting family, friends and co-workers this April Fools Day. 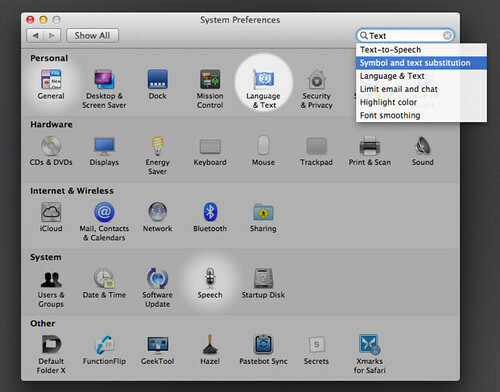 In this example I’m using a Mac running OS X 10.7.3 (Lion), but it should also work on 10.6 (Snow Leopard). 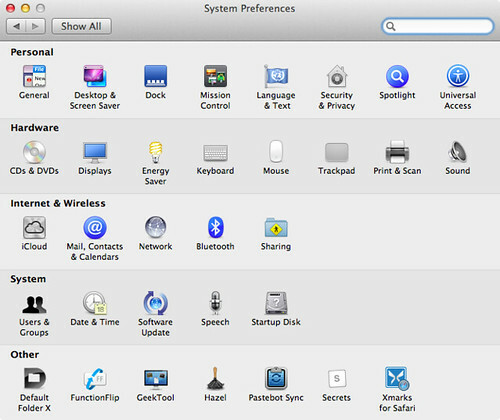 First, open the System Preferences app. Launch the Language & Text Preference Pane. 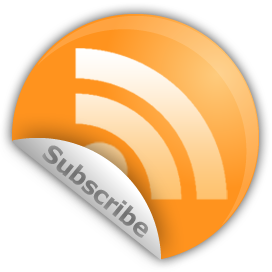 Click on the plus sign (+) to create a new symbol or text substitution. If I were your victim, you’d want to think of something I type all the time, My Name (where My Name is the persons name or whatever text you want to have AutoCorrect change), for example. Enter that in the Replace column. 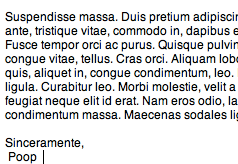 Now, here’s the best part—in the With column enter the text you want to be replaced when your prankee types My Name. Because I’m so cool and sophisticated I would go with something like Poop. 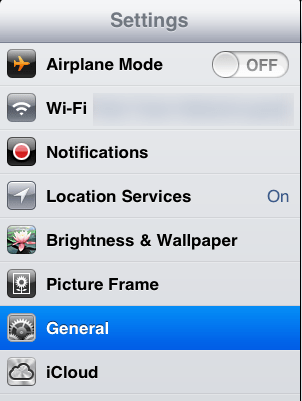 Be sure to close the System Preferences app to cover your tracks. After you’ve added your entry to AutoCorrect it will be available in most of the apps on the Mac: Mail, iCal, TextEdit, Pages, Keynote, Numbers, etc. Now, imagine the following scenario. 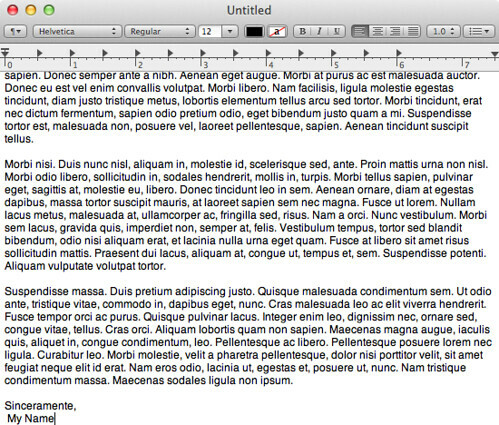 I, your hapless target am completing a moving letter in TextEdit and have just typed My Name. Bang, I’ve just been pranked! Now, let’s see how to do this on a PC. For this example I used a PC running Windows 7 and Microsoft Office 2010. To my knowledge it should also work on Windows XP or Vista using Office 2003 or greater. 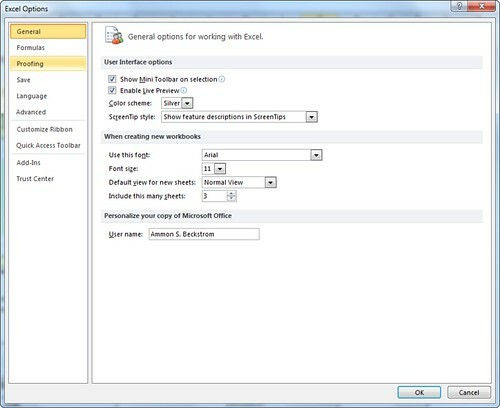 Go to the File menu in an Office 2010 application, like Excel in this example. Click on Options. 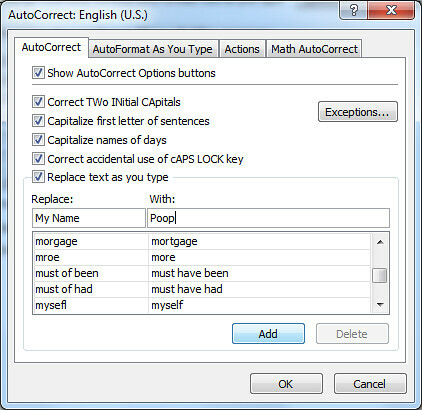 Then, click on the AutoCorrect Options button. Similar to what you did on a Mac above, enter the text you want to change in the Replace column and what you want the substitution in the With column. To keep things consistent we’ll go with My Name and Poop again. Click on OK to save your changes and then close out of the Options window. 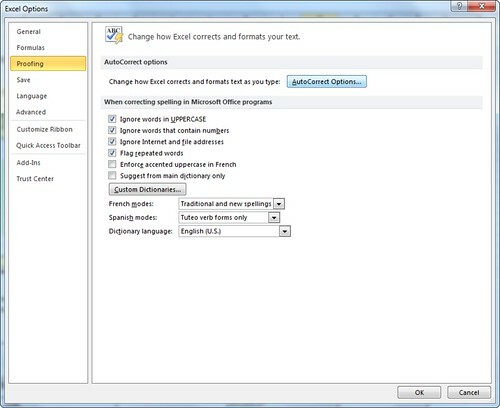 Even though you added the AutoCorrect in Excel, it will be accessible on all Office 2010 programs including Word, PowerPoint, and Outlook. 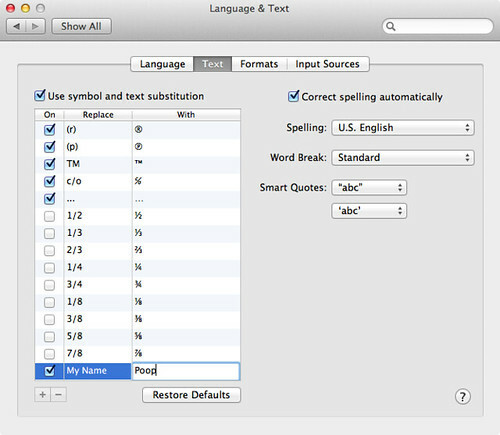 Lastly, let’s see how to add AutoCorrect entries to an iOS device—an iPad, iPhone, or iPod Touch. To add an entry tap on the plus sign (+) in the upper right hand corner. Entering AutoCorrect shortcuts is a little different in iOS. First, type in the Phrase or word you want to substitute. Again, we’ll go with our old standby, Poop. Next, type in the Shortcut you want substituted. Please note that it must be one word only. So instead of My Name you’ll have to just use Name in this example. 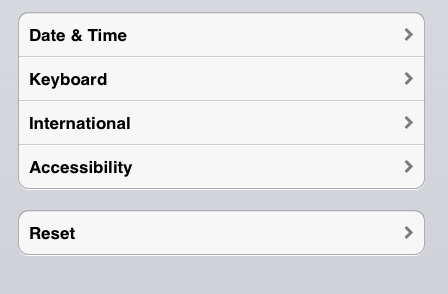 Tap Save and close out of the Settings app. The next time the recipient of your pranking prowess prepares a message in Mail.app and enters their Name they’ll get, you guessed it, Poop. One quirk with iOS devices is that before the AutoCorrect occurs they may actually see a little popup before the text substitution happens. This would give them the option of tapping the little ‘x’ next to the substitution to cancel it. Given the proliferation of humorous AutoCorrect sites on the Internet, it’s a safe bet that your target will fall victim to your prank. Now you’re all set for April Fools Day. Go forth and prank merrily. What pranks do you plan on pulling this year? Or what are the best pranks you’ve pulled on April Fools Days past? Sound off in the comments below. This entry was posted in iOS, Mac Tips, MacTacular and tagged apple, April Fool, April Fools Day, AutoCorrect, holidays, humor, ios, ipad, iphone, jokes, mac, Mac OS X, microsoft, office, postaweek2012, Practical joke, pranks, windows on March 31, 2012 by Ammon. Is your Mac’s Address Book teaming with duplicate contacts? Do you have multiple cards for the same people—one with the home number, one with the work number, and one with the mobile number? Have no fear! OS X has a built in shortcut to help you tame your Address Book contacts in no time. Simply select two or more duplicate contacts and hold the shortcut combo key Shift, Command, and I. 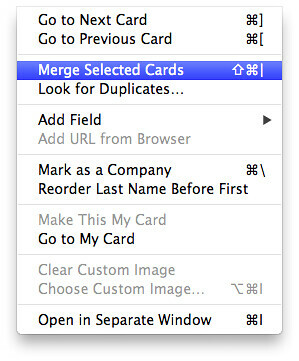 If you can’t remember the shortcut, go to the Card menu and select Merge Selected Cards (or you can search for it using the Help Menu). The only downside of this approach is that you’ll have to go through your contacts, one-by-one. However, the granular level of control you have over your contacts more than outweighs this. 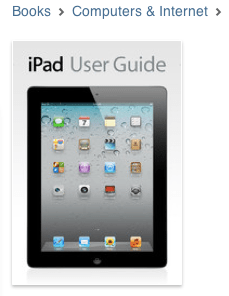 This entry was posted in Apple, Mac Tips, MacTacular and tagged Address Book, apple, Command key, guide, how to, iphone, mac, Mac OS X, osx, postaweek2012, shortcuts, tips on March 3, 2012 by Ammon. 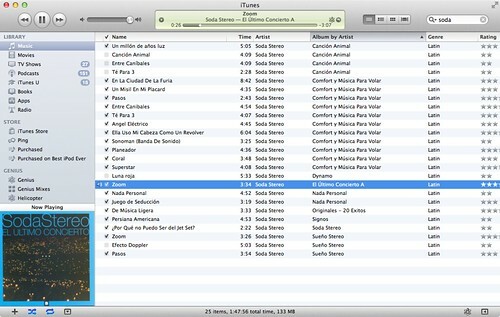 A recent update to iTunes finally fixed a long-standing annoyance. 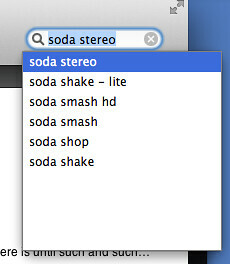 For years if you wanted to search in the iTunes Music and AppStore (or your iTunes library itself) you had to hold the shortcut key combo of Option, Command, and F.
This is a total break in UI consistency in how most apps on the Mac platform implement search. When Apple released the Mac AppStore earlier this year they got search right by using the same shortcut every other Mac app uses. And now, finally, I can use the same shortcut to search iTunes that I use to search the Mac AppStore, a Web page in Chrome, a spreadsheet in Numbers, or even the draft of a blog post in MarsEdit. Simply hold the Command and F keys to go to the search field. One of the first things I noticed after upgrading to the iCloud compatible iTunes was this fix in functionality. Although it may have appeared earlier, I’ve just noticed it with the recent upgrade to iTunes 10.5. … and in your iTunes Music Library, Videos, Apps, Books, etc. Fixing the iTunes search shortcut may seem like a small change, but it’s so much more convenient to have a uniform shortcut across all apps on the OS. Have you noticed any other recent changes for the better (or worse) in Lion, the latest version of the Mac OS X operating system? Sound off in the comments below. This entry was posted in Apple, Mac Tips, MacTacular, postaweek2011 and tagged apple, apps, AppStore, how to, itunes, iTunes Music Store, mac, Mac OS, Mac OS X, shortcuts, tips on October 22, 2011 by Ammon. Yes, I have a degree in IT. No, that doesn’t mean I automatically know how to use every single feature of every single computer program ever written (I wish!). Even though this might violate the unofficial “guy code” and the “geek protocol” I’m going to come out and admit to something. Whoa, you have no idea how much better I feel now! That was really liberating. 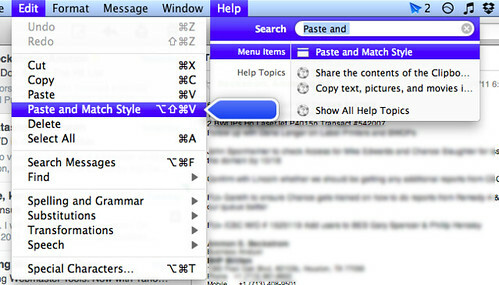 Finding help on for Mac apps couldn’t be easier. You can use Google and pray that you type in something that gives you back something relevant or you can the Help Search function built in to every new Mac since late 2007. If you don’t know how to use Google you’re probably also running Windows and I can’t help you (no one can). Sorry. 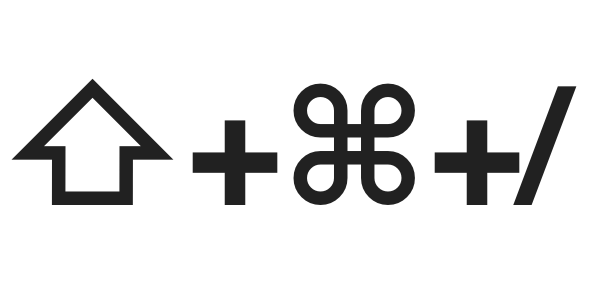 If you’re on a Mac, you’re in luck—I’ve got a great little shortcut to share with you. 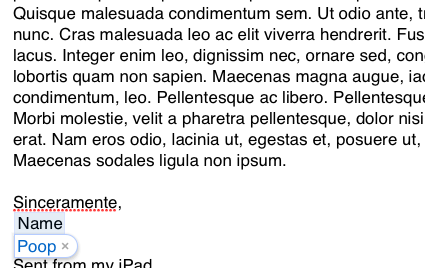 Let’s suppose I’m writing a message in Sparrow and want to copy some text from a Web page in Chrome, but also want it to have the same formatting as the rest of the email. To find out how to do that hold the Shift, Command, and Forward Slash keys and then — BAM!!!! 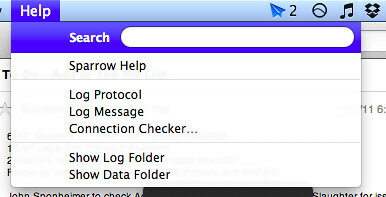 The Help Menu Search comes up for Sparrow (or whatever the active application is). As soon as I start typing, suggested menu items start to appear. 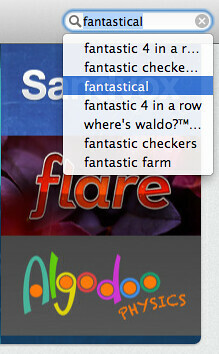 The more text I type, the more refined the search results appear. 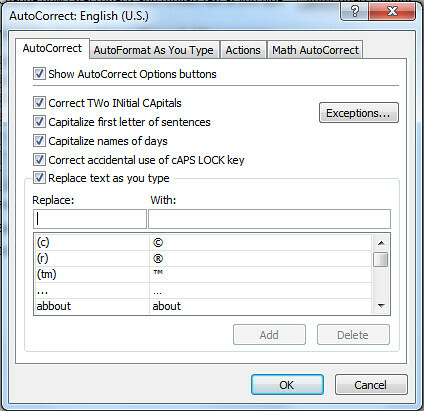 I can use the keyboard arrows to select the desired result; how to paste text and match document formatting in this example. 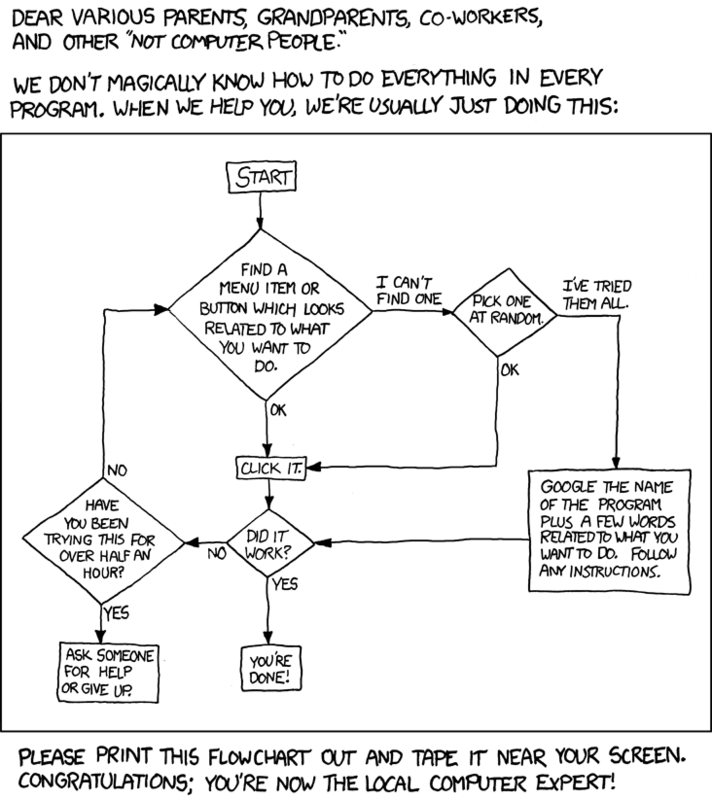 The popular Webcomic XKCD has perfectly summed up how I go about helping when I’m asked how to do something on a computer with this handy, dandy flowchart. Where do you go for IT help when you don’t know what to do? Sound off in the comments below. This entry was posted in Apple, Mac Tips, MacTacular and tagged apple, Google, help, mac, postaweek2011, shortcuts, tech, tips, Xkcd on October 8, 2011 by Ammon. Ah, April 1st, the day on which, as Mark Twain said, “we are reminded of what we are on the other three hundred and sixty-four”. What better way to have some fun today than to mess with someone you love by messing with something they love. If they own a Mac, here’s a simple trick. When they’re not looking quickly enter the following shortcut on the keyboard. This key combo causes Mac OS X to invert all your display colors. In most cases this will induce panic on the unsuspecting user who returns to find their beloved Mac looking all wonky. Because this is a relatively obscure feature of Mac OS X it should take them a while to figure out how to return their Mac to normal. If you’re quick you can even do it right in front of them. As long as the person you’re pranking has their eyes on the screen and not the keyboard, they’ll have no idea what you did or how to fix it! 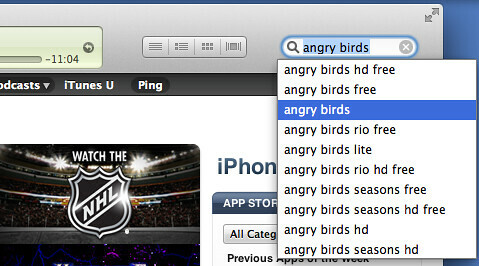 For some reason, Apple thought this was a useful feature to include in their OS. Apparently, it’s supposed to help provide relief when your eyes get tired (via Silvermac). My time as an IT auditor left me paranoid, so I never leave my MacBook without locking the Desktop. 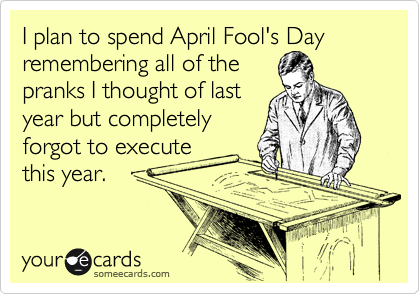 If you fear reprisal for your April Fool’s Day activities (or if have any common sense) you would do well to do the same. 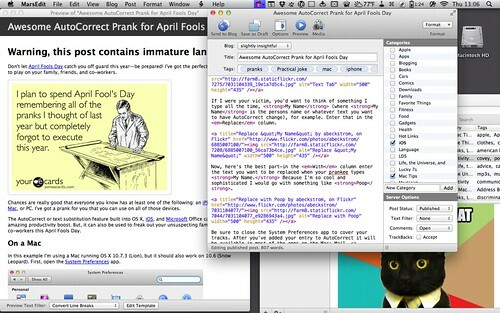 Do you know any other great ways to prank a Mac user? Sound off in the comments below. If you’re still using a PC, the joke is already on you. 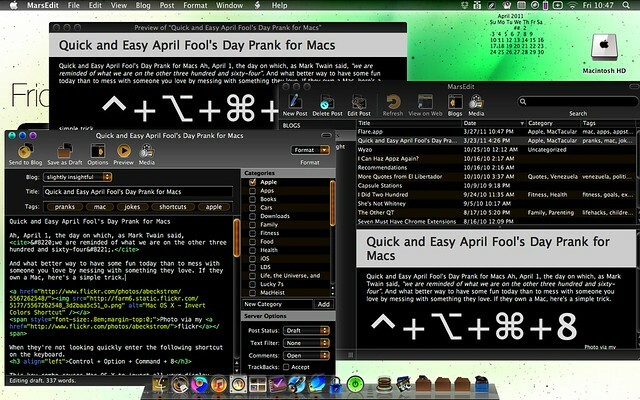 This entry was posted in Apple, Mac Tips, MacTacular and tagged apple, April Fools Day, holidays, humor, jokes, mac, Mac OS X, postaweek2011, Practical joke, pranks, shortcuts on April 1, 2011 by Ammon.